Born in Marseilles (France) in 1978, Gaëlle began the guitar at age of 6 with René Bartoli. With 14, she won three gold medals at the Conservatoire de Marseilles and as the best student of all instruments, was awarded the Prix de la Ville de Marseille. Afterward she studied with Alberto Ponce at Conservatoire Supérieur de Musique de Paris, Roberto Aussel at Musikhochscule Köln (Germany) and Alvaro Pierri at Université du Québec à Montréal (Canada). 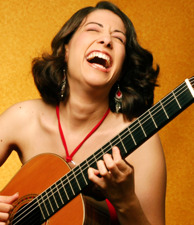 She participated in many masterclasses with legendary guitarist such as Pepe Romero, Antigoni Goni, Roland Dyens, Oscar Ghiglia, Leo Brouwer, Alvaro Pierri and Joaquin Clerch. Among the many international prizes she has been awarded are: 1st Grand Prix at Alessandria Competition, 1st Prize in Locquémeau, 1st Prize in Savona, 1st Prize in Sernancehle, Finalist at Concert Artists Guild New York, Honor Diplom at Accademia Chigiana and 2nd Prize at Guitar Foundation of America. She has performed in Festival such as Ile de France, Noches en los Reales Alcázares in Sevilla, Festival dAvignon, Festival Montpellier-Radio France and at Salle Cortot (Paris), Zellerbach Hall (Berkeley), Tsuda Hall, Nikkei Hall, Oji Hall in Tokyo, Merkin Concert Hall (NY). She recorded for NHK, France Musiques, RFI, and RAI.Gaëlle played with the Berkeley Symphony, the Garde Républicaine Orchestra and the Philharmonic Turin Orchestra. She toured in more than 30 countries including Germany, Myanmar, Bulgaria, Canada, Denmark, Israel, Spain, France, Gabon, India, Iceland, Italy, Laos, Malaysia, Morocco, Mexico, Palestine, Philippines, Puerto Rico, Portugal, Serbia, Switzerland, Tunisia, US. Having a passion for contemporary music, Gaëlle performed the 1st interpretation in Italy of Concerto by Maurice Ohana, the creation of the Double Concerto by Naomi Sekiya with Kent Nagano in Berkeley, the creation of three new compositions at Cordoba Guitar Festival 2006 and the creation of a new piece for clarinet and guitar by Ibarrondo. Her curiosity to explore the boundaries between classical music and popular music leads her to get a "Meisterklasse" diplom in « Akustische Gitarre/Konzertmusik/worldmusik/Jazz/Pop » with Thomas Fellow at Musikhoschschule of Dresden. Gaëlle has been teaching at the Superior Conservatories of Cordoba (2002-04) and Sevilla (2003-09) in Spain. Appreciated teacher, she now travels all over the world to give concerts and masterclasses as well as workshops and to be jury at national and international competitions.